Piper nigrum Linn or Black peppercorns is produced through steam distillation to get the aromatic, odorous constituent of the spice i.e., the volatile oil. Whilst the pungent, non volatile principles for which the pepper is so highly esteemed as a condiment is present in its oleoresin, which is obtained by the extraction of berries with volatile solvents and concentrating to remove the solvent. 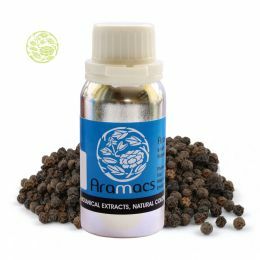 The crushed black pepper generally yields 1 to 2.5 percent of volatile oil which contains mainly Terpenes, Sesquitenpenes and Oxygenated compounds, and is used for flavouring and perfumery. The oleoresin of pepper contains Alkaloids, Piperine (4-10 percent) and Chavicine, which contributes for its pungent taste. Description: Oleoresin Black Pepper is the natural extract of dried tender berries of Piper Nigrum Linn of family Piperaceae. Manufacturing Process : It is obtained by the solvent extraction of Black Pepper and the solvent traces are removed by distilling it in vacua at controlled temperature. Physical Appearance : It is a yellowish brown viscous liquid with pungent slightly biting aroma of Black Pepper.